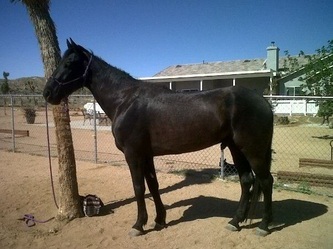 Tenny was adopted March 25, 2012! 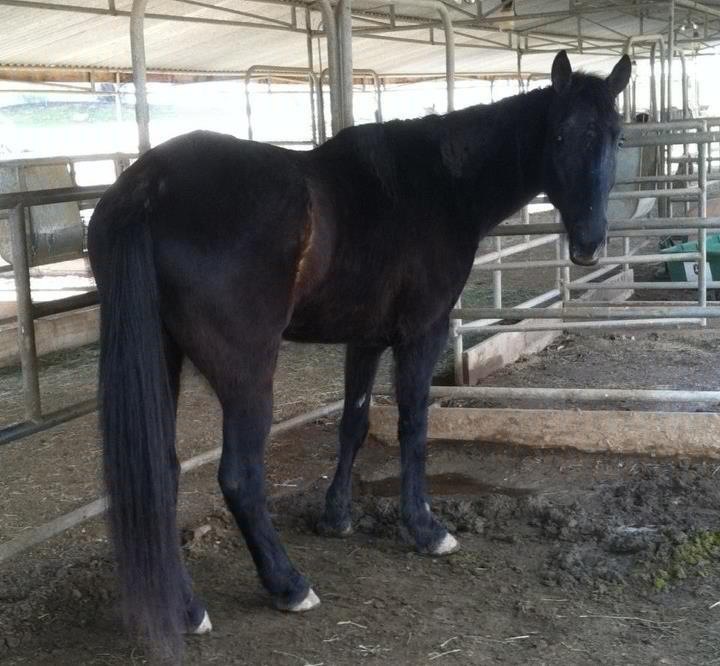 In October 2011, Toby’s Legacy co-founder Lisa Bone was at a shelter to help transport a horse for another rescue. As she approached the shelter, a Tennessee Walker in the closest corral run up to greet her. At 10 years old and 16 hands, “Tenny” was a sad sight: just skin and bones with a shaggy coat and bald spots. Fortunately for him, Lisa only saw his potential. On the spot she decided she would be taking him back to Toby’s Legacy. Unfortunately, his case for starvation/neglect was still open and it would be another month before he could be moved to the ranch. In the month he waited, Tenny put on a little weight but was far from healthy. When he finally arrived at the ranch he was still grossly underweight and also suffered from a skin infection that was hard to treat. He was so itchy and loved to be scratched from head to toe. Tenny steadily gained weight, his skin healed, and the bald patches grew in. After being evaluated, Tenny was found to ride nicely under saddle. Coming as no surprise to Toby’s Legacy, there was a lot of interest when Tenny was made available for adoption in DATE. He was eye-catching, handsome. 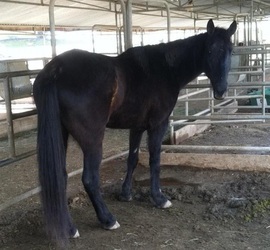 One potential adopter, Pauline Young, was offering Tenny the opportunity to live on several acres with horses, goats, and a menagerie of other rescued animals. When Pauline and her husband came to meet him Tenny laid on the charm. By the time they left Pauline's husband said, “I don't think I have a say in this. Her decision is made." Sure enough, Pauline called Toby’s Legacy later that day and adopted him. Tenny's story is the stuff fairy tales are made of. Tenny was with Pauline for three years when updates became nonexistent and stories weren't adding up. Tenny was no longer in her care and she was not forthcoming in information. We invest in the rescues for the life of the life each rescue and take a breach of our contract very seriously. So, we went to work tracking him down to make sure he was safe. What we learned is he had been abandoned by Pauline sometime in 2015 at a training stable. He ended up in the hands of another person who took him to Mike's Auction in 2016. That auction is frequented by kill buyers. we sent out a post that was shared almost 200 times and reached almost 12,000 people. We found Tenny!!!! Vanessa and Kent saw Tenny at the auction and outbid the kill buyer. She saw our post and contacted us. Tenny is in an amazing home, extremely well cared for, and happy. You can't ask for a better ending than that. 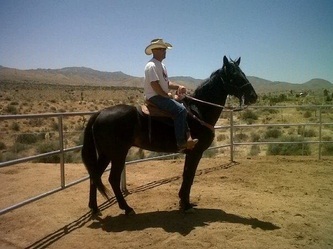 We are just so thankful to everyone who shared that post and believe in keeping the horses safe and accounted for. Here's a crazy twist. Kent is a former co-worker of mine at SDFD! So, thankful Tenny, now named Doc, landed softly with a wonderful family. There are many, many more sweet souls like Tenny sitting in shelters and feedlots. Will you help us rescue another life? 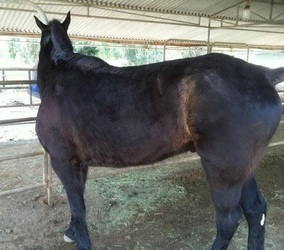 Please consider sponsoring a horse or find out how you can get involved!